So, my blog has been super neglected, not for a horrid reason but because my life has been totally turned upside down in the last 3 months. I had the Battle of the Beadsmith which was an AWESOME, AMAZING and very humbling experience!!! Humbling because I got knocked out in the first round, but Awesome and amazing to be included in this SPECTACULAR group of people. I had so many problems coming up with the right piece for the Battle. I wanted it to be beautiful, and colourful, and represent me without being too much like my other work. In the end, I am my own biggest critic and I ran out of time so I had to stick with project attempt number 6 which I called "Soft Metal"
ALAS my beads were the FIRST thing to be unpacked in the move (after the kettle, and coffee mugs), I opened the box to absolute TURMOIL!!!! I can't find ANYTHING in this mess!!! I'm still trying to sort through everything, BUT I am going to apologise to my Bead Soup Partner Mandy as I forgot to photograph the "soup" when I got it, and when I went to photograph them last night I couldn't find HALF the things that you sent me!!!! So here are some of the gorgeous things that Mandy sent me. I LOVE the gorgeous feathers that Mandy sent me, I am currently working on a project (in my head) which includes feathers in a cuff but I'm sure you'll hear more about that when I finally start really making it!!! Everything was so gorgeous, but with limited time and trying to make something whilst moving, I made a simple spiral rope pendant necklace with a gorgeous purply/blue/white focal. I couldn't quite capture the gorgeous colours in the focal so you may have to use your imagination LOL!!!! I ended up using the really cute bronze clasp at the front of the picture to clasp it!! Mandy I hope I did you proud, I will get around to working with everything else that you sent me, and I will post them as I make things. I sent Mandy some Bead Embroidery items as she said she'd like to try it and has never done so before. I can't wait to see what she made!!! so pretty! It DOES have such a nautical feel to it! Thank you so much!!! Check out my latest blog for your chance to win one of my Bead embroidered rings. beautiful necklace with your soup, and sorry to hear you got knocked out of the competition because your piece is just stunning! 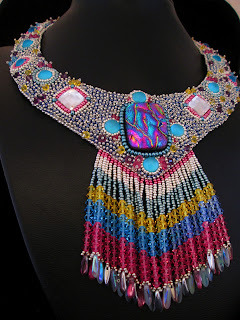 OMG how do you make such elaborate beadwork!!? The piece you made for the competition is simply awesomly stunning! You won your own competition with that!!! Love the blue one too!!! Beautiful design!! Nice job with your soup! Such amazing work..Wow! Another very uber talented beader!! Glad you finally seem to be getting your life settled down. Nice beadwork on your necklace. Great job. Love that brilliant blue pendant. It is a beautiful necklace. What a fantastic piece. Beautiful. I hope your move went well! I love the focal, and I hope you'll let us know if you use the other pieces -- I'm intrigued by your feather idea! Beautiful soup! Hope you get settled in nicely soon! Your blue focal necklace is beautiful - definitely nautical! And, your Soft Metals necklace - gorgeous!! It sounds like you've been SUPER busy and in the midst of all that you knocked out this beauty of a necklace. Quite remarkable! It's really a fabulous piece. What? That stunning piece got knocked out the first round? Your bead work is fabulous, and so is your bead soup piece. I hope things smooth out very soon for you! That's a beautiful necklace. You did a great job with your limited time and while moving too. It had to be tough. Good luck with the cars. for this limited time you had and all these compications, you did a beautiful job. the necklace looks very classy and came out fabulous! Fabulous job -- and a fun read. I hope you are enjoying your new place and that things settle in, and that your car behaves! wow, what a beautiful focal. the colors you used are quite striking!! Beautiful creation! I hope you are settling in ok!